Earring Studs or Necklace/Pendant and Chain Gift Boxes. Red colour Textured finish Crocodile Lizard Skin effect style finish. External Size 58mm x 52mm x 30mm deep. Leatherette White finish jewellery insert Pad to accept Earring Studs or will hold Pendant on light chain or Necklace. Red Alligator Skin design Crocodile Lizard Textured finish stylish Jewellery Stud or Necklace Pendant Box at wholesale price. 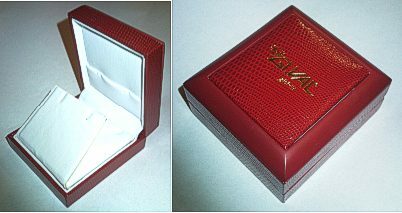 Brand marked 'GI.VAL' 'gioielli' on Top of Box with Diamond emblem. Quality finish Red textured design Crocodile skin Lizard Jewellery Gift Box.